I’ve had the privilege to live in Botswana now for almost 10 years. I love this country. I love that it’s home to me. I love the beauty of this land and the faces of her people. When I think of living a brave life or what living a brave life looks like, I honestly don’t have to look very far. It’s here in this land that I see it. I see it in a young lady who made a courageous choice to keep her baby even when the world would tell her she has every right to make it go away. I see it in her eyes as she walks into a hospital of a developing nation, scared, but knowing she has to be strong. I see it in her as she tenderly nurses her son, not knowing what exactly the future will bring, but knowing that she’s not alone. I see it in a young man who has a bright future of university ahead of him, only to be given the full responsibility of his younger siblings while his mother recovers from an illness that brings uncertainty. I see it in his eyes as he watches his siblings play, wondering how things will look in a few months. I see it in him as he picks up the responsibility of a dad role, but also knowing that he’s not alone. I see it in a married couple as they get ready to welcome their fourth child after a long complicated 8 months of pregnancy, only to be told that the baby has no heartbeat. I see it in their eyes as they try to make sense of what just happened. I see it in them as they grieve the loss of this child, but also knowing that they aren’t alone. I see it in a child who has no mother or father who love her or place to call home. I see it in her eyes as she watches those around her and longs for a mommy or daddy to love her. I see it in her as she discovers and experiences love and a home and knows that she’ll never be left alone. The list goes on and on. It’s all around me in these beautiful people. They have taught and continue to teach me. These are brave people in my eyes. These are people who despite the hurt and the fear, continue to move forward knowing that there is something on the other side. 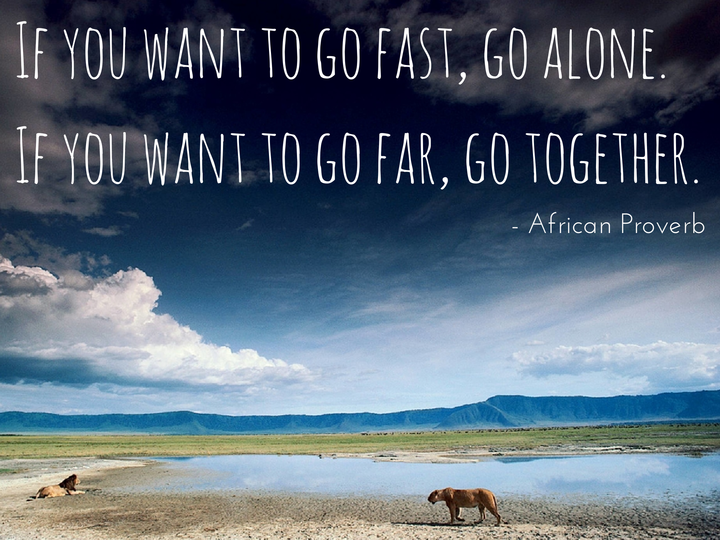 One of my favorite African Proverbs says, “If you want to go fast, go alone. If you want to go far, go together.” We can’t get very far without help. It’s about having people come along side them to tell them they aren’t alone and that they are strong enough to do it and support them in the process.